There are plenty of gift guides out there this time of year. These are just a few of my favorite gifts on the market this year. Remember, that when buying gifts for your mother/daughter/sister/significant other, that their taste and interests should be your guide, not the way that marketers gender items. Take it from girls like Maggie and Riley. Nefarious Ideas Journal ($10) I love this notebook. It’s a great stocking stuffer or gift for anyone, really, but I especially like the idea of a tween toting this around to jot down ideas and thoughts. Because, you know, kids can be kind of devious and hilarious. Goldie Blox Toys ($16-$85) Goldie Blox and other building toys are really fun for kids and their parents. Hands-on fun can counteract all that screen time, too. Feminism is for Everybody Wreath ($40) This beautiful wreath would look great in a feminist’s office or home. It’s handcrafted and whimsical, while also sending an important message. Stars Hollow T-Shirt ($20) Any Gilmore Girls fan would love this shirt. It has an understated design and looks super soft and comfortable. Yoga, Sports, or Dance Equipment Once the holidays are over, a lot of people are determined to keep those New Year’s resolutions. Gifting yoga, sports, or dance equipment can be a way to show your support and give someone a gift they’ll really get a lot of use out of. For little ones, the Little Yogis Kit ($25) can help introduce them to healthy exercise early on. Ann of Green Gables Doll Outfit ($40) Dolls are a classic holiday gift. I know that getting my American Girl dolls made for some of the most exciting Christmases of my life. Doll clothes and accessories are also a fun gift for a doll lover. I love the handmade outfits I got for my dolls at craft shows. This dress and pinafore set is perfect for dressing a doll like Ann of Green Gables. Strong Role Model Dolls by Sew Whimsical (~$115) These soft and cuddly dolls are hand sewn to resemble real, living women who are good role models. Pride and Prejudice Cookie Cutters ($14) If you know a baker who also loves to read, these Pride and Prejudice cookie cutters are a perfect present. Pair them with a cookie mix. Sainted Writers Candles ($10) These are handmade by a former classmate of mine. There are so many authors to choose from. These candles are a great gift for a reader or a writer on your gift list. What My Daughter Wore (~$19) This book is a collection of illustrations of a tween’s outfits done by her mother. It showcases the fun fashion choices of the young and fearless. It would be such a cool gift for a girl or an adult, especially someone interested in fashion, art, or design. Wreck This Journal (~$10) This one’s on my wish list. The journal is full of prompts for ways to decorate, fill, and destroy its pages. It’s a great way to get a little crafty outlet and inspire more creativity. Bossy Women Art Print ($5) For those who don’t want to ban bossy, consider this art print of a quotation from Amy Poehler celebrating bossy women. 4M Science Kits ($7-$40) I’m getting my little sister one of these and I’m looking forward to helping her with the projects included. There are a variety of kits focusing on weather, kitchen science, eco-friendly projects, and more. They teach basic science concepts and look like a lot of hands-on fun. Boy Meets World DVD Set ($50) This set would be really fun for adults or kids. In addition to this classic show, Clarissa Explains it All, Sabrina the Teenage Witch, and Doug would also make great gifts. Shark Week zipper pouch ($20) This pouch can be used for makeup and, um, other things women might need while out and about. It might also be great paired with a Hello Flo kit, especially for a girl hitting puberty. What are the gifts you’re excited to give this holiday season? I love this list, Kasey – so many fantastic ideas. 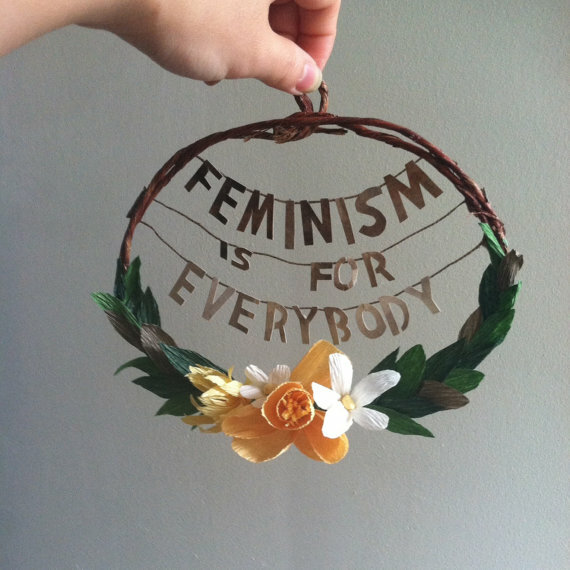 The “Feminism is for Everybody” wreath just might make its way onto MY Christmas list! Thanks for compiling these options.